Our development team (Brian) has been hard at work (literally pulling all-nighters, powered by Red Bull) to give our event calendar (seen by 900,000 people last year) a much-needed overhaul. The first thing you'll notice is that it looks a little sleeker. The second thing you'll notice is that we're now including the name of the event for each calendar listing. Organizers rejoice! But the real magic happens under the hood. 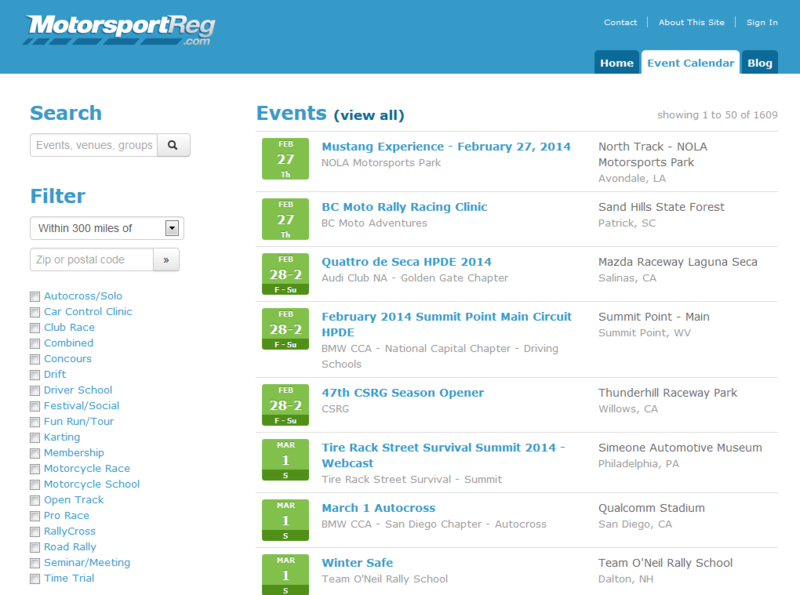 It's now easier than ever to find the motorsport events you're looking for. Just type what you're looking for in the Search box and you'll see the difference. You can search by name of event, type of event, venue, organization name, just to name a few. The possibilities are endless. Enter HPDE in the search box and get drivers schools, HPDE, and PDX events for example. Or enter Autox and get autocross, autoslalom, and SOLO events Enter Majors and get all of the SCCA majors events. Or get even more specific by adding a venue, state or zip code- like track days in California. Get the picture? This is basically the same functionality as the previous calendar but combined with the full text search, makes it much more powerful. You can now also filter only by events offering HPDE insurance. In conjunction with updating the calendar, we also updated the URL to the event pages to be more search engine optimized. In other words, if someone is looking for an organization's event using a search engine (like Google), they will more likely find the event page listing based on the changes we made. One more way to make it easier for attendees to find and register for events. And there you have it. Brand new ways to search the thousands of events listed on our event calendar. We'll be rolling out a few more calendar enhancements over the next several months, so keep your eyes open for even more ways to find what you're looking for.